The sniper's task usually include, but are not limited to, counter-sniping operations, killing enemy commanders, and demoralizing the enemy, killing their ability to wage war. In the dense and steamy jungle warfare present in the Vietnam war, the uses for a highly trained sniper were many. Possibly America's most famous sniper of all time was in service during the Vietnam conflict, Carlos Hathcock shot 93 Viet Cong fighters, often tracking them for days at a time in the jungle. He is reported to have sniped one enemy at an amazing 2,500 meters. Hen was called "The White Feather Sniper" because of the white feather he carried in the band of his hat. At the height of his time in Vietnam, there was a bounty of 50,000 dollars on his head. In response to the bounty set on his head, American troops began wearing white feathers in their helmets, so that vietnamese snipers wouldn't know which one was Carlos Hathcock. There were also Viet Cong Snipers. If fact, more often than not, they were pitted against American snipers in intense sniper battles. In one to note, Carlos Hathcock shot an enemy sniper through his scope and into his head, killing him. The sniper must have been looking right at him, but Hathcock shot first, killing him. For a long time it was suspected that Carlos Hathcock's record of 93 confirmed kills had never been matched but a book written by Ward credits 101 kills to a marine sniper named Mawhinney. 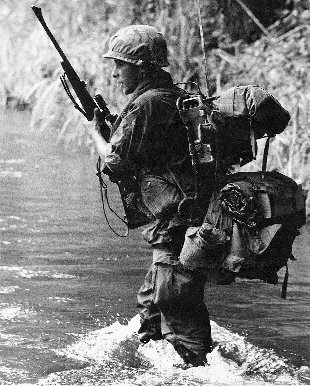 Still other accounts claim a sniper named Aldelbert Waldron II was the most successful sniper in the Vietnam conflict, with 109 confirmed kills.